Leon Gauhman: Founder at Hive, a London based studio developing digital products and services. Alfredo Aguirre: Founder and Senior Web Developer at Made with Bytes. Lucas Seidenfaden: Founder at Fashion Link and Freelance Web Developer. 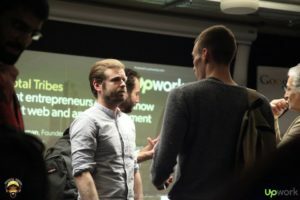 The event was sponsored by Upwork. Upwork, formerly Elance-oDesk, is a global online work platform where businesses and independent professionals connect and collaborate remotely. The panel discussion can be seen on YouTube below. Some of the things covered were the importance of having a technical co-founder, how entrepreneurs need to do as much research and market testing as possible before spending money on development, the use of open source software and cloud service providers, how to improve user experience, how to hire the right developer and work well with developers, whether to focus on delivering your product via a mobile application or if it would be more suitable for the web, the benefits and drawbacks of mobile applications and why it is better to develop iOS mobile applications as opposed to Android. When hiring developers the panel agreed that entrepreneurs should ask them if they have solved similar problems in the past and have a discussion about how they would go about working on your particular project. A good indicator of someone’s ability is to see how much they have contributed to the GitHub and Stack Overflow communities. On GitHub you should ask someone technical to comment on the quality of a developer’s code that appears there, while on Stack Overflow you should see whether the developer you want to hire is the type of person who is asking the questions or giving the answers.